On October 1st, Nothing Past Nine will celebrate its first birthday/anniversary! Hard to believe it’s already been that long! I’ve learned a lot in the past 11+ months, but I know the learning will never end. Each day is an opportunity to grow and develop as an entrepreneur and craftswoman. My current challenge, as my last post alluded to, is an upcoming craft fair. My first chance to sell my goods, as a business, in person. The woman who asked me what makes my products special has haunted me – in a good way! – and I am still working on the best answer to that question. (Hopefully, I’ll have something to run by you all soon!) 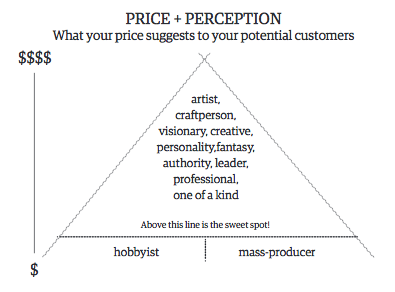 In working through this though, I came across a diagram through this Toronto Etsy Street Team post that showed what prices do to the perception shoppers have about a crafter and his or her products. While I hadn’t seen this particular image before, we did talk about this concept during my graduate school program, so it is not unfamiliar. When initially creating my pricing scheme, I knew I was on the low end, but wasn’t – and am still not – comfortable with the idea of charging what I consider too much. So what’s the proper strategy? What’s the happy medium? Since I’m not offering you much for reading this (unless you needed this shot of motivation like I did! ), let me get to the point! I have decided to increase my prices on Monday, albeit slightly. It is not because of greed, or to make this a full time job. More than anything, it is to help improve and establish the Nothing Past Nine brand. Here’s to taking one small step toward valuing myself and my work a little bit more! This entry was posted in Shop Update. Bookmark the permalink.